Hello cherished programmers! It’s Andy Gesner and the HIP Video Promo staff here with a Sub Pop morsel to keep that summer campfire of yours burning all through the fall. We’ve got the latest from the increasingly prominent alternative country/folk motor babies Blitzen Trapper headed in your direction. This time they seek to capture the demons of their troubled past and their recent success in a tribute to the rural and suburban American havens that housed their traveling souls for the last several years in “Love The Way You Walk Away,” the latest single from their September release American Goldwing. 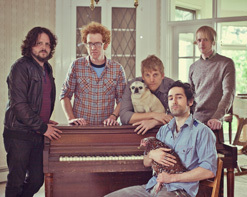 Blitzen Trapper have come a long way on the dusty beaten roads of rock and roll fantasy. Rising up out of the slums of Portland, Oregon, singer and songwriter Eric Early had beaten homelessness through endless touring and dearly deserved success. The band had earned themselves much critical acclaim since their third release Wild Mountain Nation in 2007, claiming accolades from Pitchfork, The Nerve, and Spin Magazine. The title song of that album also madeRolling Stone’s “Best Songs of 2007” and truly introduced the band to the hungry ears of the nation. Blitzen Trapper went on to perform to thousands at festivals like Lollapalooza, Newport Folk Festival, Coachella, Pitchfork, and Monolith, as well as nationally televised shows like Late Night with Conan and, later, Late Night with Jimmy Fallon, earning a dedicated and sometimes obsessive fanbase. The release of Furr in 2008 was a high-water mark for the group as their eclectic new songs received a two-page feature in Rolling Stone. The album was ranked #13 on Rolling Stone‘s “Best Albums of 2008” while the title track was ranked on the magazine’s “Best Singles of 2008.” Similar praise from these and other critics continued with last year’s Destroyer of the Void, continuing the group’s existence as a critics’ crush. Not letting a day go by unutilized, Blitzen Trapper returns with a monumental new record titled American Goldwing. The record aims to take a snapshot of the golden age of rock and country with nostalgic references to Lynyrd Skynyrd, 1970’s vintage Tom Petty, banjos, harmonicas and the occasional yee-haw. The title refers to a moment in Eric’s childhood where he became trapped underneath the weight of his brother’s Honda Goldwing motorcycle he had accidently tipped onto himself while pretending to race it. The album’s most precious gem is “Love The Way You Walk Away,” a beautiful breakup song, strumming and chugging away a Dylanesque story of getting wrapped up in the wrong kind of trouble after the girl walks away from the relationship. The track is immersed in twang and sweet banjo plucking away at the small town memories capsuled within. The video follows the group as they rehearse the song in their modest abode and then set out to conquer the road once again. As they travel, playing to possessed fans across the nation, the band stops to enjoy the fruits of their labor by camping in the countryside. Anyone who’s ever been a traveling band of any size knows that the best memories are captured in these humble moments of connecting with nature, stepping away from the complexities of the modern universe that inevitably exist around them. The “Love The Way You Walk Away” video encompasses this ideal in perfect fashion, allowing every viewer to live a day in their lives for a few unforgettable minutes. This fall, the group continues down the path with a national tour, spanning into the holidays, in support of the album’s release. We’re thrilled to showcase another Blitzen Trapper video for your viewing pleasure, thanks to the amazing folks at Sub Pop. If you need more info, call Andy Gesner at 732-613-1779 or e-mail us at HIPVideo@aol.com. You can also visitwww.SubPop.com or www.BlitzenTrapper.net to find out more about Blitzen Trapper and any tour dates near you.